Normal bowel movement color is brown, usually a medium-dark brown. Any color except this is not necessarily normal and can indicate a hidden pathology, either a sensitivity or intolerance to certain foods, an adverse reaction to medication or various disorders and conditions. Green stools for example can be caused by a number of things, from eating spinach to having undiagnosed gallbladder problems to taking certain medication that shorten transit time or affect gut bacteria. Green stools are not a cause for concern if they are infrequent, occurring occasionally and at wide intervals of time. But if they occur too frequently, then they may be a reason for concern and should be investigated by a doctor. 1) Well-formed, solid, but soft, dark green stools, sign of a fast transit often due to high fiber intake and caused by eating spinach or other strong pigmented green foods, for example. 2) Soft blobs of medium to light green stools, often caused by a too high fiber intake from eating green foods or by gallbladder problems, antibiotics, antacids etc. 3) Mushy pieces of lighter green stool, sometimes green-yellow stool; usually with ragged, irregular edges: indicates diarrhea and can have functional or infectious causes. 4) Watery, green diarrhea: caused by anything from bacterial, viral and parasitic infections to bad reactions to food or medication to inflammatory digestive conditions. It is a reason for concern because it poses the greatest risk for dehydration. 5) Mushy, fatty green stools that float: the green color indicates an unusually fast transit time; the floating is called steatorrhea, meaning the presence of excess fat in stools and is caused by eating too much fat, gallbladder, liver or pancreas problems or infectious causes of a viral, bacterial or parasitic nature. Clear mucus present in small amounts is normal, but mucus of different colors or excess mucus are signs of inflammation. Particles of undigested food may be present as well. 6) Green diarrhea with pink or red streaks: the pink or red indicates the presence of blood, most likely fresh and coming from the lower half of the gastrointestinal system (the bright color means blood wasn’t digested). Diarrhea with blood is a medical emergency and requires immediate medical attention. 7) Bluish-green stool: what causes bluish-green stool is eating dark-colored foods, usually dark green or purple-black like spinach, chard, kale, blueberries, blackberries, black cranberries. 1) Eating green foods. Spinach, kale, chard, dandelion greens, beet greens, green peas, broccoli, mustard greens, turnip tops, sorrel, patience dock, raw pistachios, spirulina, chlorella and all strong pigmented green foods will color stools green. The more you eat, the darker green the stool color. If you eat lots of green leafy vegetables and dark purple, blue or blue-black fruits like blueberries, then stools may look bluish-green. If you eat green foods only once, then you’ll likely have only one green bowel movement. If you eat green foods several days in a row, you may continue to have green bowel movements several days after you discontinue the pigmented foods, the time it takes for the body to process and eliminate the green foods. In this case, the color is a result of the chlorophyll in the foods and the stools may be solid, well-formed or mushy or watery. 2) Food dyes and supplements. Green food coloring used in cakes, pies, cupcakes or processed candy, gelatin (usually chlorophyll) and algae supplements like spirulina or chlorella can cause green stools. Try to remember what you ate to see if you can identify dietary causes of this unusual stool color. Read more about Stools Colors: What They Mean. 3) High fiber intake. Eating too much fiber causes a faster than normal transit time. This reduces the time needed for digestive enzymes and gut bacteria to properly digest bile (which is actually green) and can result in green stools. If transit time weren’t reduced, then bile would have time to be processed and stools would be brown. Depending on how much fiber you eat and how much it affects your transit time, you may experience anything from well-formed, soft, amber stools to watery, green diarrhea. 4) Medical conditions. 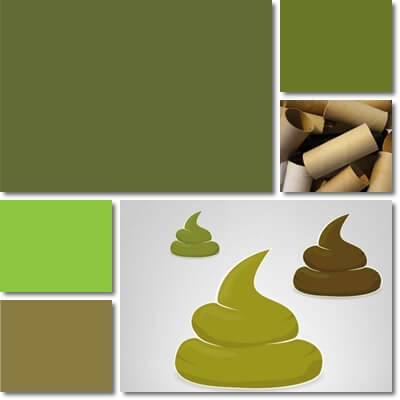 Diseases that may cause green stool color include inflammatory gastrointestinal conditions such as Crohn’s disease, ulcerative colitis, irritable bowel syndrome and hyperthyroidism. These conditions predispose to diarrhea and can end up causing green stools as a result of the reduced transit time. 5) Food sensitivities or food intolerance. Lactose intolerance can lead to diarrhea and sometimes green stools as the person with the intolerance is unable to properly digest dairy which results in altered gastrointestinal function. Fructose malabsorption is another example of food intolerance which can produce symptoms as diarrhea, sometimes severe enough to cause green stools. Severe gluten sensitivity in celiac diseases produces the same effect as well as fatty stools, whole food allergies may also manifest with symptoms such as diarrhea and possibly different stool colors, depending on how severe the diarrhea is. All manner of food intolerance, sensitivity or allergy is a source of disrupted gastrointestinal function and malabsorption problems, causing inflammation and reduced transit time, with the potential for diarrhea and green stools. Trigger foods may range from the obvious gluten grains (wheat, rye, barley) and dairy to the less obvious onions, garlic, banana, avocados or spicy foods like chili peppers or ginger. 6) Infectious diarrhea: bacterial, viral or parasitic infections. A stomach bug (bacterial gastroenteritis), stomach virus (viral gastroenteritis) or intestinal parasites infections like giardiasis all have symptoms such as diarrhea and have the potential to cause loose or watery green stools. Usually when the cause is an infection, other symptoms such as fever, nausea, vomiting, loss of appetite, cramps right before diarrhea in gastroenteritis or abdominal pain, itching, nausea in intestinal parasites infections. Intestinal parasites infections are treated with anthelmintics while bacterial gastroenteritis is treated with antibiotics; both require medical attention for diagnosis and treatment. If you observe red streaks of blood in stools, seek medical attention immediately. 7) Functional diarrhea. Functional diarrhea is diarrhea without a known cause and more common in adults than in children. It is difficult to diagnose because it requires excluding many other causes like inflammatory bowel diseases or food intolerance, allergies or sensitivities, but is a possible cause of loose green stools. 8) Laxative foods. Coffee, caffeinated beverages like green tea, alcohol and foods containing sorbitol like sugar-free chewing gum, dried plum, apples, peaches all have laxative effects and can cause loose, green stools. The more you eat foods you are sensitive to or which have laxative effects, the stronger the side effects. 9) Medication: antibiotics, laxatives or stool softeners, antacids, proton pump inhibitors (omeprazole, esomeprazole, pantoprazole), antidepressants, chemotherapy and some supplements can cause loose or watery sometimes green, sometimes yellow stools. Antibiotics for example disrupt healthy gut flora populations which digest food and process bile and can cause yellow or green diarrhea after the first 2-3 days of treatment . Antacids are often made from magnesium and, if taken in large amounts or for too long, can cause muscles to relax, including the muscles of the gastrointestinal tract, resulting in loose, possibly green bowel movements. 10) Hormonal changes and transition diets. Hormonal changes during late pregnancy, thyroid hormone imbalances, transition diets such as babies going on solid food, liquid diets, juicing diets or fasting can lead to diarrhea and yellow or green bowel movements. Green bowel movements in women that cannot seem to be explained by diet are often caused by hormonal changes or hormonal imbalances. What symptoms of green stools to look out for: presence of significant amounts of mucus or abnormally colored mucus (anything except transparent, whitish or slightly yellowish), irritation and itching, dehydration, presence of blood (either as bright red or pink streaks or spots or dark colored), weight loss and loss of appetite, persistent abdominal pain are worrisome symptoms that require you to make an appointment with a doctor for investigations. Green stools and cancer. Green stools do not usually mean cancer. Pink or bright red bowel movements indicate fresh bleeding and either hemorrhoids or fissures or polyps and tumors nearby. Dark red or brown with red undertones as well as black stool colors can mean cancer. If you experience red or black bowel movements or bowel movements with fresh blood more than once or twice, see a doctor for some tests. Are green stools a cause for concern? In most cases, the causes for green stools are non-infectious diarrhea caused by a high fiber intake or mild adverse reaction to some medication like antibiotics or antacids and eating green-pigmented foods. The only time when they are a reason for concern is when they occur together with unusual symptoms such as fever, nausea or vomiting (indicating an infection like gastroenteritis or food poisoning), abdominal pain and significant weight loss or occur as severe diarrhea that continues for more than 24-48 hours, increasing the risk of dehydration. Watery, green diarrhea in adults and children is abnormal and can be caused by an infectious agent which is why it’s important to seek medical help as soon as possible. 1) Discontinue green and deep purple or blue-black foods to see if stool color changes. Discontinue any supplements that might color stools, meaning spirulina, chlorella or iron supplements. 2) Limit fiber intake or discontinue fiber supplements. 3) Avoid processed foods with lots of food coloring to see if normal color returns. 4) Have tests done to diagnose potential underlying medical conditions and treat them. 5) Keep a food diary to understand which foods you are intolerant or sensitive to and avoid them. 6) If infectious, see a doctor for adequate treatment (antibiotics for bacterial gastroenteritis and anti-parasitic medication for intestinal parasites). 7) For gastroenteritis, stay hydrated, eat light, rest and take your vitamins (read more about Gastroenteritis: Causes, Symptoms and Treatment). 8) If you also have diarrhea, it could help to follow a BRAT diet (read more about What to Eat When You Have Diarrhea). 9) Learn to avoid foods with laxative effects. 10) Read the label on medication for side effects like diarrhea and talk to your doctor about how to best counteract them. For example, after finishing antibiotics, eat more Foods for Healthy Gut Bacteria to restore beneficial flora and regulate digestion. Conclusion: What does green stool mean? For the most part, having green stools means you ate significant amounts of green, leafy vegetables like spinach, kale. If bowel movements are loose, it’s likely you had too much fiber, reducing your transit time which doesn’t allow sufficient time for bile to be digested properly, hence the unusual color. Essentially any food that causes diarrhea has the potential to also cause watery green stools, depending by how much it reduces transit time. Infectious agents like bacteria, viruses or parasites can also cause infectious diarrhea and possibly green stools, as well as inflammatory conditions of the digestive system like irritable bowel syndrome or celiac disease, usually in response to problematic foods.